In the image above, north is to the left and east down. 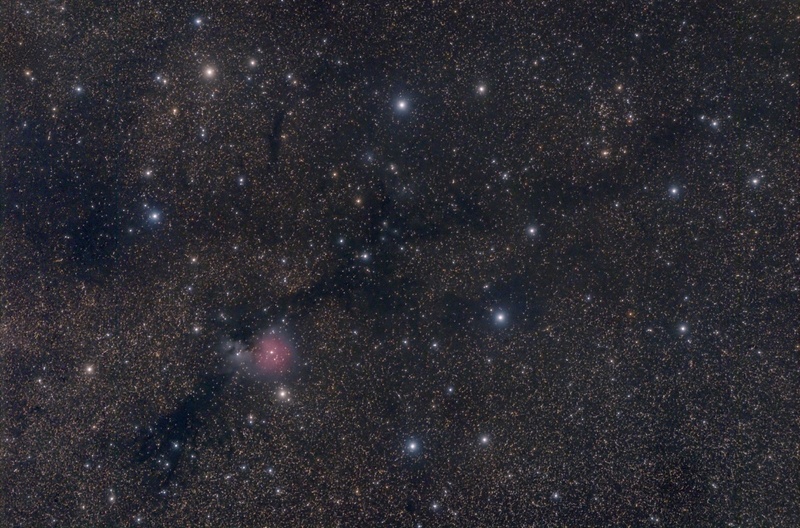 Sh2-82 is a small emission nebula visible in the constellation Sagitta, located about 2 degrees south of the "Coathanger" asterism. It lies in a region of the Milky Way which is obscured by many lanes of dark nebulae, some of those can be traced in the photo above as well. Sh2-82 is a H II region associated with a reflection nebula, its distance is about 1100 parsecs (3590 light years), which corresponds to the inner edge of the Orion Arm of our galaxy. The star primarily responsible for the excitation of its gas is the blue star of main sequence HD 231616, of magnitude 10.1, and spectral class B0.5V. Inside the cloud sources of infrared radiation have been identified, including one generated from a protostar deeply shrouded in gas. Radio waves originating from small sources have also been detected, a sign that there are processes of star formation on-going inside the cloud. Notes: Photo taken during my stay at the Großglockner-Hochalpenstraße in September 2015. See an Observation Report of this event (in German).